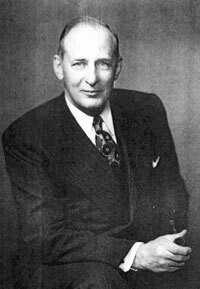 President of Carolina Power & Light (CP&L), Louis Sutton was born the son of a Richmond, VA, tobacco manufacturer. In 1910, Sutton graduated from Virginia Polytechnic Institute with an electrical engineering degree. Junior Achievement He also was a cadet captain and a varsity football player. Sutton joined General Electric's training program in Lynn, MA, after graduation. He joined CP&L as a statistician, before being promoted to commercial manager supervising sales and local offices. In August 1924, he joined Arkansas Central Power Company as assistant general manager, and then as vice president and general manager of Mississippi Power & Light Company. In 1932, Sutton was re-hired by CP&L as vice president. When CP&L President Tilley died in 1933, Sutton was named president on March 23, 1933. During the Depression and faced with new power plants coming on line, Sutton cut rates for homeowners as long as their total bill did not drop below prior years. Instead of having homeowners cut power usage as they did in many states, Norfth Carolina homeowners actually doubled their power use. This "inducement rate" became a model for the industry. Under Sutton's leadership, Carolina Power & Light grew from 62,500 customers to more than 530,000 customers, while its generating power increased a thousand-fold. Sutton served as president of the Edison Electric Institute and the Business Foundation of The University of North Carolina. He was North Carolinian of 1953 by The State magazine, and Man of the South for 1966 by Dixie Business Magazine. As The State noted in their award: "he demonstrated that not only could an investor-owned and privately managed utility adequately meet the power needs of a state, but also that a great corporation could be humanized, kept close to the people and be responsive to their aspirations."